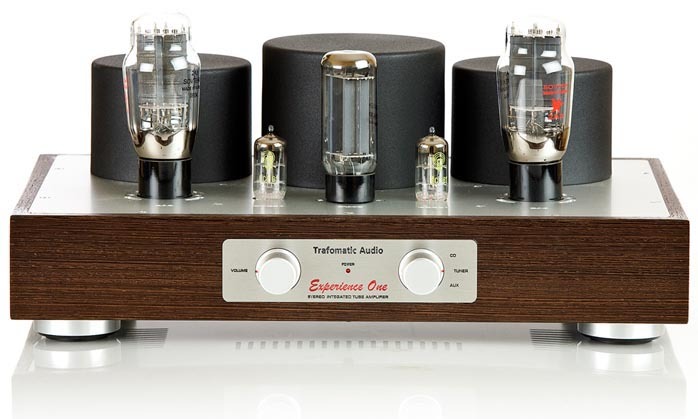 This is the ninth in a series of reviews dedicated to the concept of 32Ohm Audio as embodied by the store of that name in downtown Portland/Oregon and described here - Ed. Room size: The sound platform is 3 x 4.5m with a 2-story slanted ceiling above; four steps below continue into an 8m long combined open kitchen, dining room and office, an area which widens to 5.2m with a 2.8m ceiling; the sound platform space is open to a 2nd story landing and, via spiral stair case, to a 3rd-floor studio; concrete floor, concrete and brick walls from a converted barn with no parallel walls; short-wall setup against 8-meter expanse and 2nd-story landing. 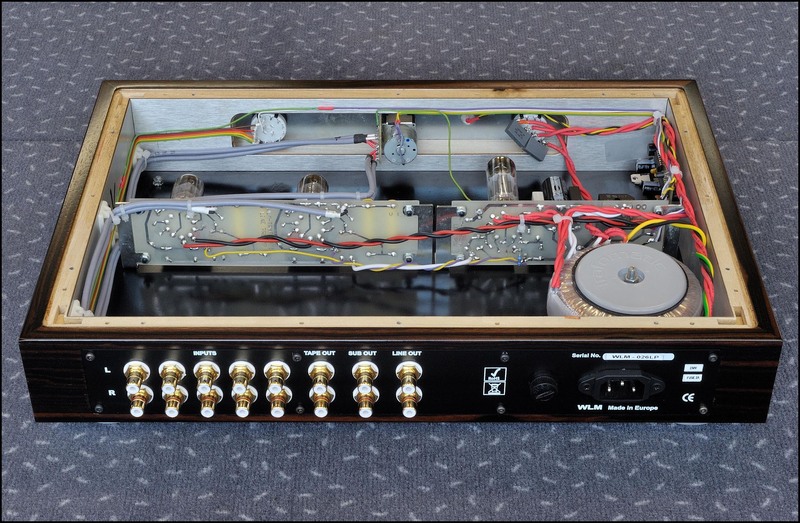 Like 007's nemesis with the golden gun, Sasa Cokic of Trafomatic Audio in Serbia's Mladenovac has grown more dangerous. Not to himself but to competitors. 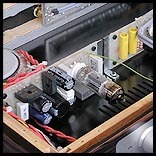 With his own valve gear, he always knew how to make good sound without asking a fortune. He's a true transformer expert who rolls his own for each application. The kind of fit 'n' finish he could achieve was simply handicapped. He still lacked a certain kind of specialty experience. And tools. 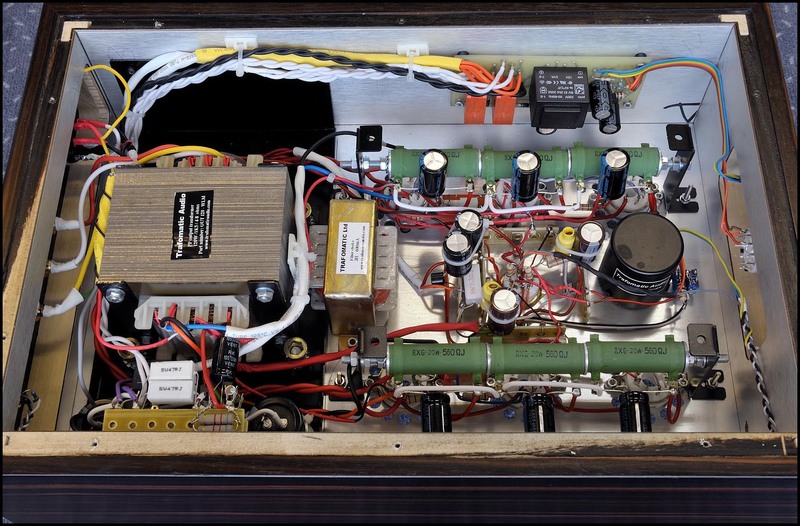 His ascent to WLM Acoustics' chief engineer at large —Sasa designs the circuits and builds all sub assemblies and transformers—created a small infusion of working capital. 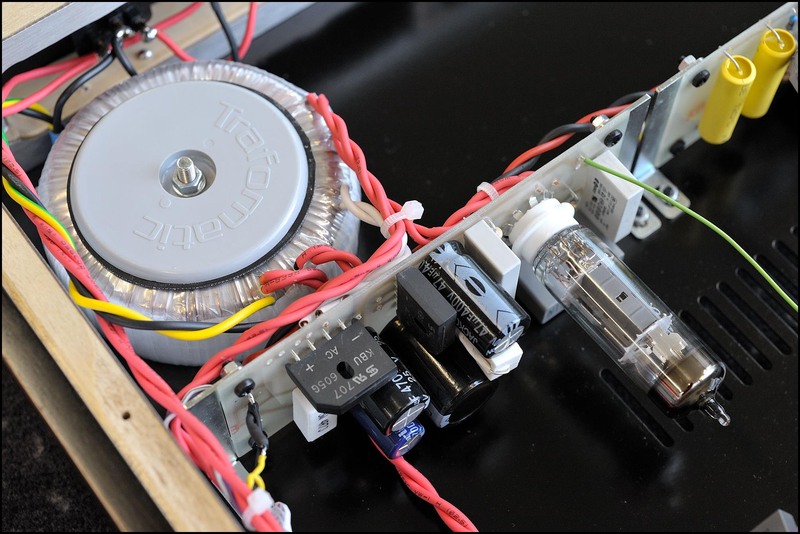 Sasa immediately invested that into a new dedicated assembly facility, hiring more personnel and acquiring his own CNC router. 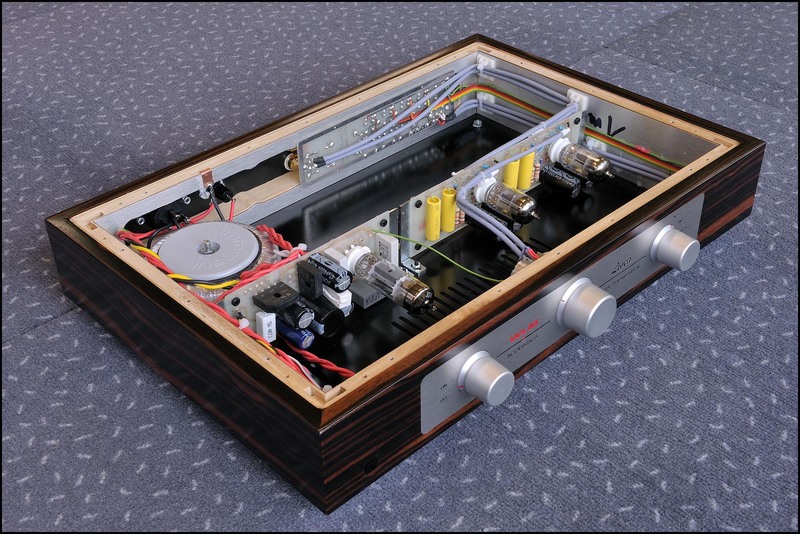 The Austrian connection with wood-work champ Hannes Frick & Co. rubbed off further. 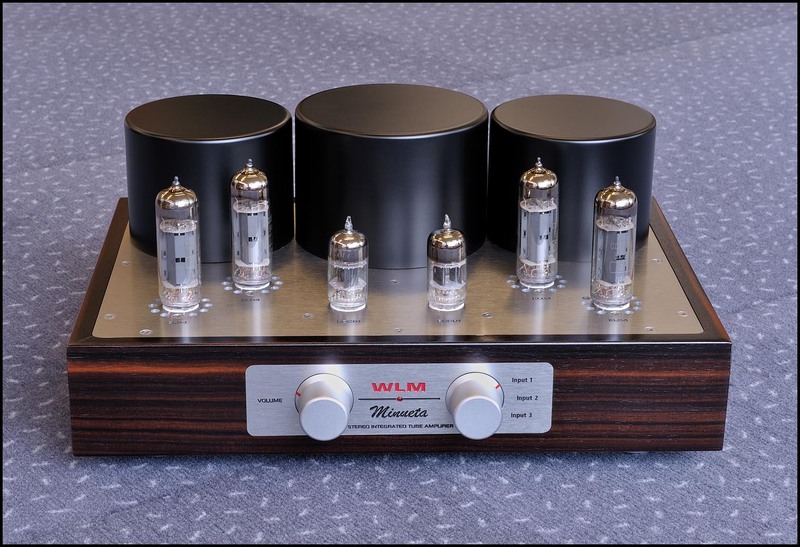 During a grueling 3-day training course at the WLM facility in Sülz, Sasa and two of his key men were shown certain expert tricks on how to achieve the immaculate finish level WLM demanded for its new brand of WLM Acoustics tube electronics. 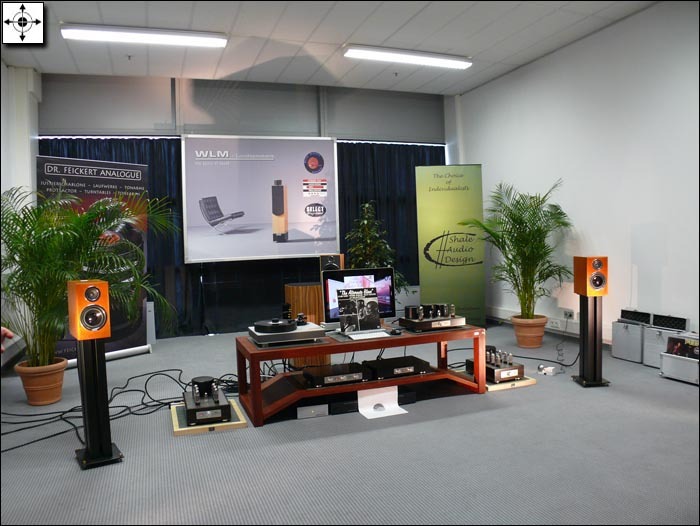 Once the WLM project had aced the proof-of-concept hurdle (sound) and the bigger Austrian standards challenge (these designs can be built to cosmetic spec in Serbia), the formal roll-out of an ambitious number of brand-new WLM models occurred at the HighEnd 2009 in Munich [below]. 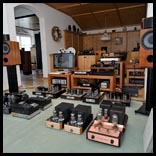 Ever restless, Sasa Cokic immediately applied his new tools and skills to face lift his own Trafomatic Audio models well before he set off for his first-ever German hifi show. That showing led to our first-ever Harvest Moon Award for personal achievement. To document the progress for his own brand, Sasa next submitted these images of his existing but revamped Experience line. Credit for these photos goes to his Serbian friend Miodrag Jovic (e-mail credit on the enlargements of the Head One photos farther down the page). 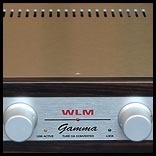 The visual tie-in with the WLM Acoustics models was deliberate. 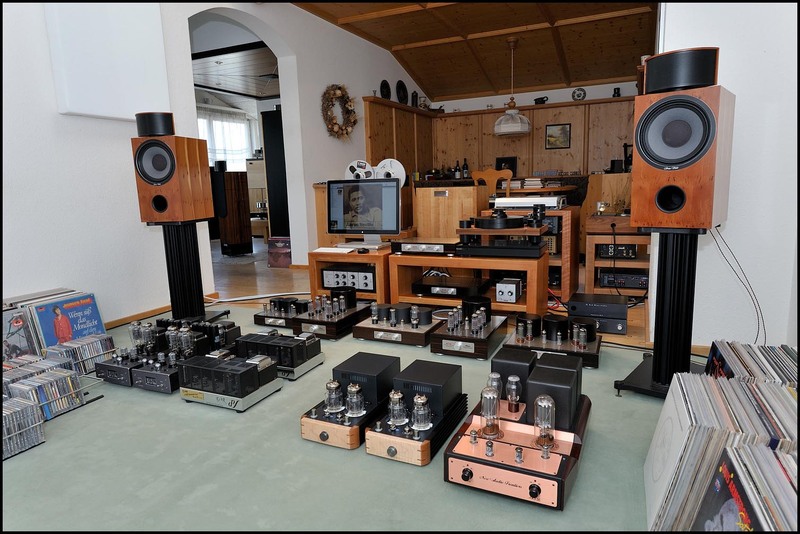 "For Hannes, I designed push-pull circuits around EL84s and EL34s exclusively to meet the criteria of his speaker models and tastes. 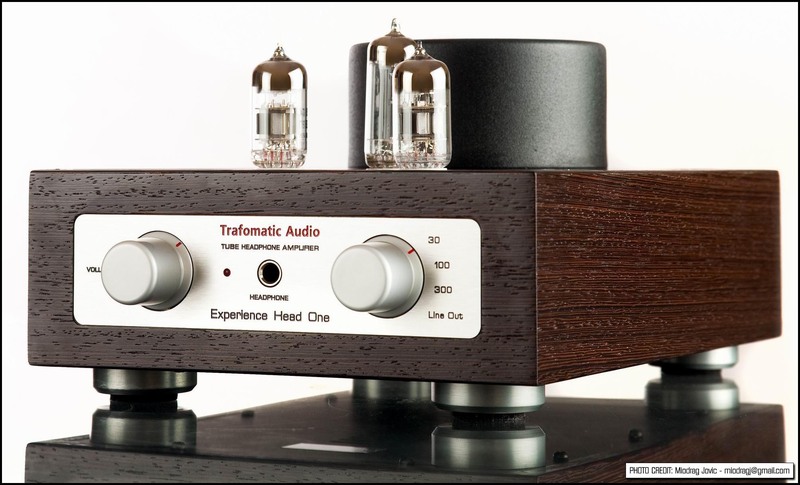 At Trafomatic Audio, I already had 2A3 and 300B single-ended integrateds, 2A3 and parallel 300B monos, a headphone amp/preamp and transformer-coupled power filters. 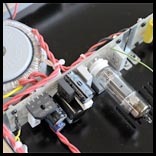 Adopting the same cosmetics we developed with Hannes made sense for those WLM clients, dealers and distributors who might prefer SET circuits and triodes. 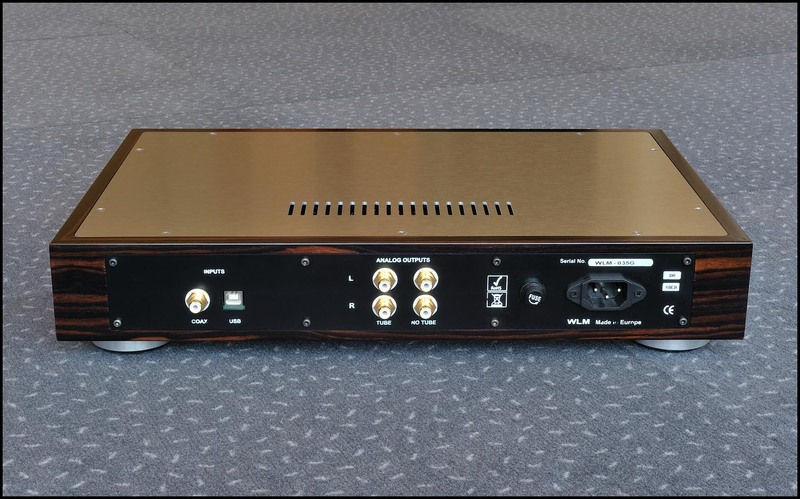 We do have one 6550 push/pull model called the Experience Elegance under our Trafomatic brand and we're currently working on a remote-controlled 45wpc integrated version for €3.300, €180 for the remote. 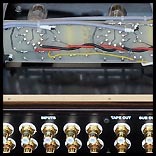 Yet for the Experience Elegance amplifier, I retained the original front panel dress plate as you can see below. 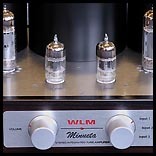 So there's zero overlap or competition with WLM. Rather, we have a nice strategic dovetailing to cover many different bases without doubling up." 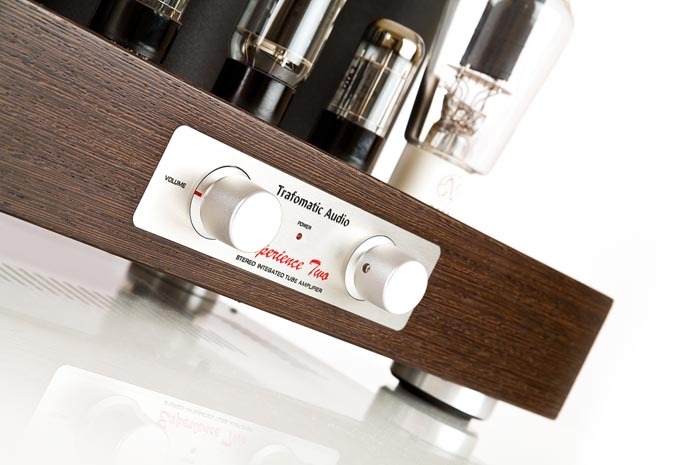 Those whose only hesitation with Trafomatic Audio in the past had to do with appearance no longer need to restrain themselves. In their price range, these models are now as bling and gussied up as good conservative taste would want. Naturally, looks aren't everything. The time had come to take another - um, look at the Experience line and report on sonics. As a headphone listener, I was curious about Trafomatic's Experience Head One. 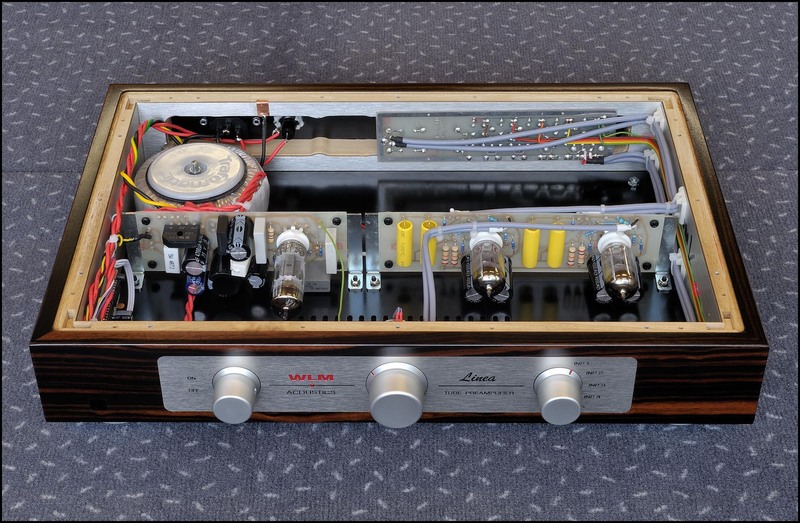 That's an unusually flexible tube-rectified design with multiple impedance taps for the ear speakers. 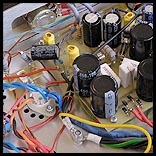 It also runs a pair of 6S45P triodes with 1.8dB of negative feedback on the outputs while one EZ80(81) becomes the indirectly heated rectifier. 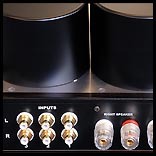 Two inputs switched via rear-mounted toggle and twinned pre-outs for biamping or subwoofing* turn this piece into a bona fide small preamp as well. 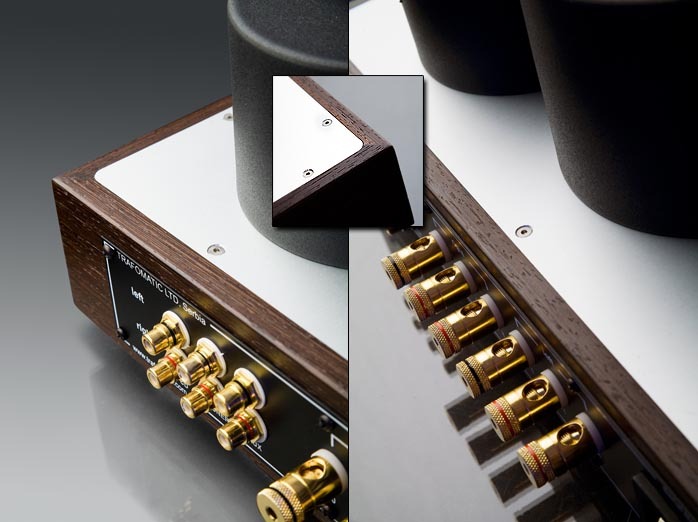 The right four-pole control on the front selects from 30, 100 and 300-ohm loading for the headphone output or preamp duty in its last position. 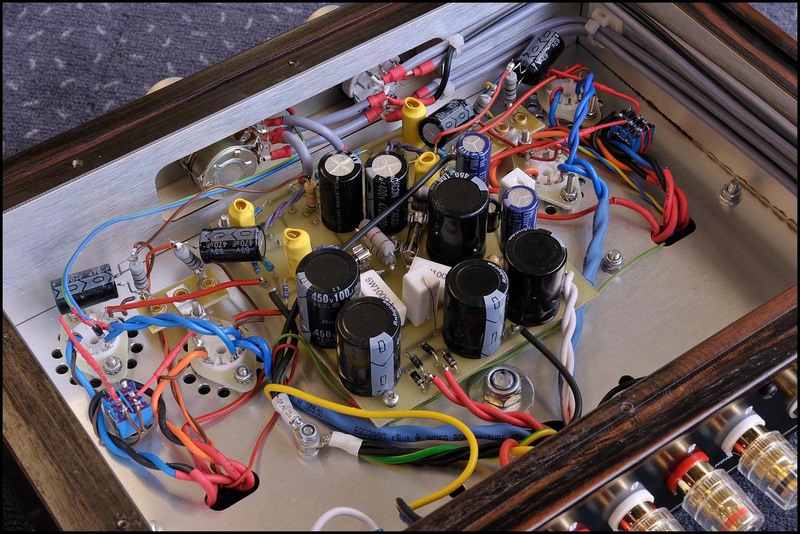 Max output power on the 1/4" socket is 300mW while preamp gain on the pre-outs is 18dB with a max voltage swing of +/-9V. 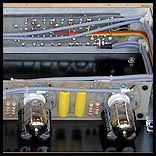 Beyond the expected Trafomatic trannies and choke, parts include Rubicon electrolytics, an Alps potentiometer and metal-film resistors. 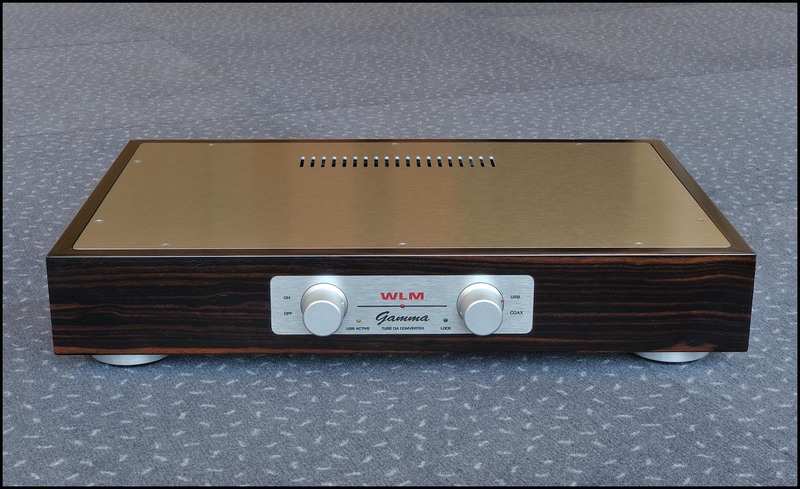 * The subwoofer output isn't of the same quality as the main output and thus not to be used as a pre-out into a speaker amplifier. 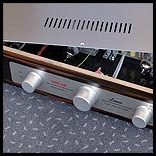 It was particularly designed for low frequencies. 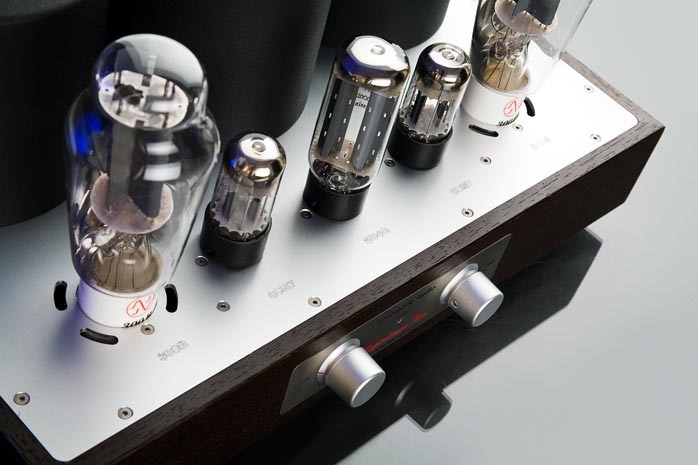 Sasa's headphones of choice are the same AudioTechnica ATH-W1000s I owned before acquiring their W5000 cousins. 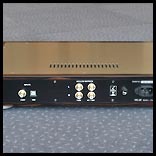 The noise floor of the new and revised Head One was optimized for high-sensitivity ear speakers of this caliber over the amp's first iteration when Sasa still listened to lesser headphones of lower sensitivity. 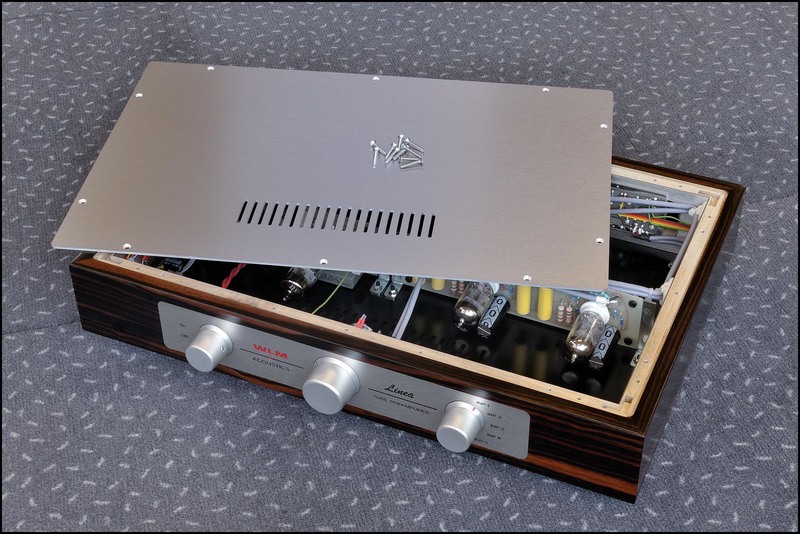 My favorite in-the-head amp of course is Shigeki-San's Yamamoto SoundCraft HA-02. Fairly or not, that's what the Serbian would have to compete with. 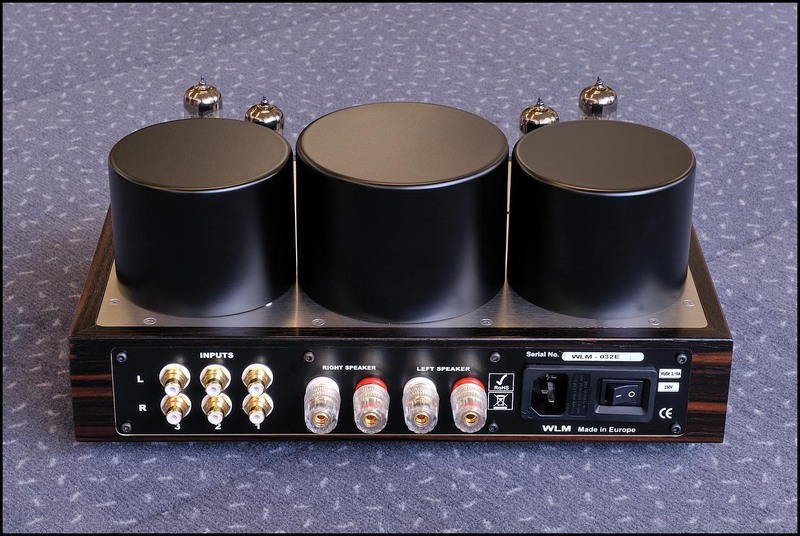 But the KingRex HQ-1 Headquarters was in for review as were Vinnie Rossi's Isabellina HPA and Ken Ball's stunning ALO Audio Rx, both battery-powered, the latter portable. 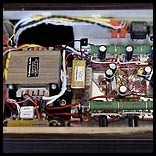 And I had my Woo Audio Model 5 with EAT 300Bs and twin 5U4G rectifiers. 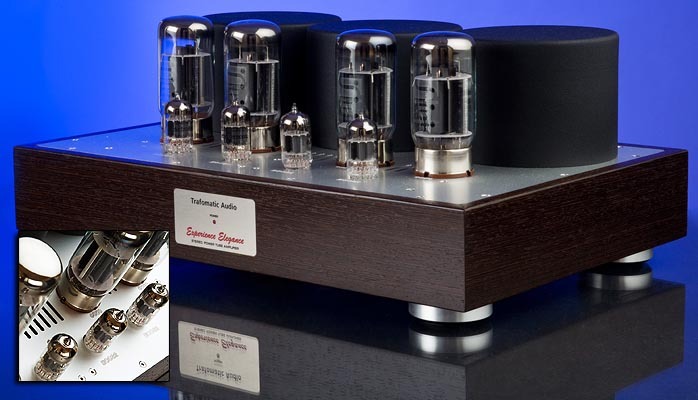 The cards were quite stacked against the Serbian, particularly since I'd also acquired pairs of Sennheiser HD800s, Grado PS-1000s and AKG K702s to take the full measure on future headphone/amp assignments.